Doll Baby Ranch Ranch - Payson, Gila County, Arizona, Headquarters West Ltd. 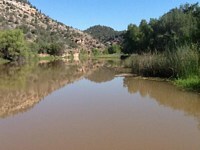 The Doll Baby Ranch is located approximately 11 miles West of Payson Az. and about 1 1/2 hour north of Phoenix Az. The Payson area has been recognized as Arizona’s cool mountain town of the Rim country. This area is popular due to its Scenic mountain vistas, mild climate, and quality of life. The Payson area has had rapid growth in the last few years, and deeded land is becoming harder to find. The improvements consist of 1 owner’s home approximately 2,700 sft, 1 manager’s home approximately 2,000 sft, Horse/Hay barn Rock construction, various corrals. 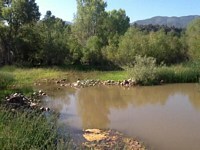 4 wells on deeded land, numerous springs and creeks, and dirt tanks on forest, the East Verde River flows through the allotment and the deeded land, there are 309 acre feet of grandfathered surface water rights for irrigation. The Doll Baby Ranch is one of Arizona’s historic Ranches, there is a lot of history attached to the Ranch from Apache and Yavapai villages to Arizona’s first Pioneers. This is a nice working cattle ranch is a very desirable part of Arizona. 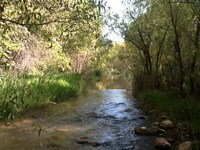 Access to the Ranch is Excellent and it is a short 10 minute drive to Payson.